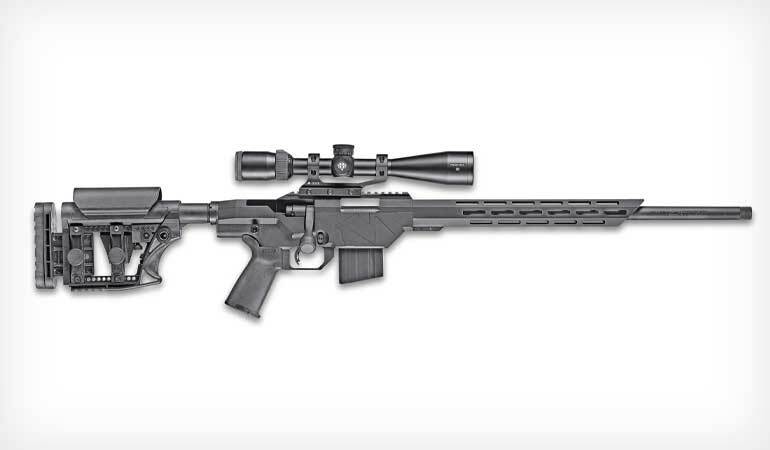 Mossberg offers two rifles chambered in the new .224 Valkyrie cartridge. When I think of the grand old firm of Mossberg & Sons, I immediately think of shotguns. But Mossberg is a player in the rifle market, too, and it has an impressive array of neat models to prove it. In addition to numerous rimfires, Mossberg offers the value-packed Patriot bolt-action centerfire chambered for several popular big-game rounds as well as the AR-style Mossberg Modern Rifle (MMR). 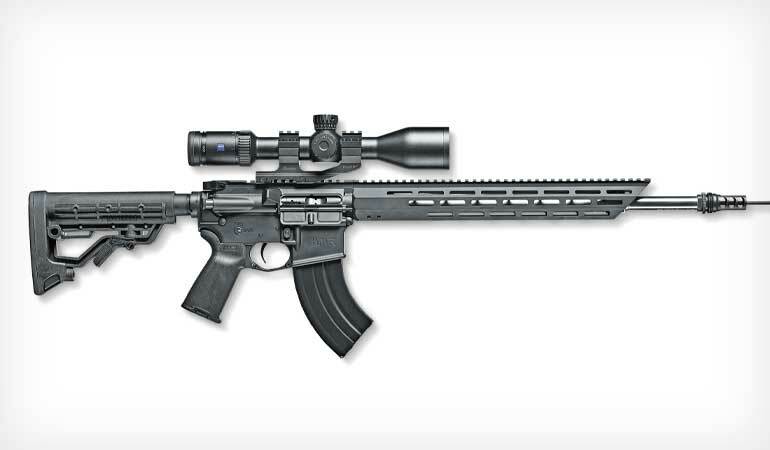 The latest rifles from Mossberg are chambered for the hot, new .224 Valkyrie. Developed by Federal, the Valkyrie cartridge has some highly specialized design features that make it especially suitable for long-range shooting. 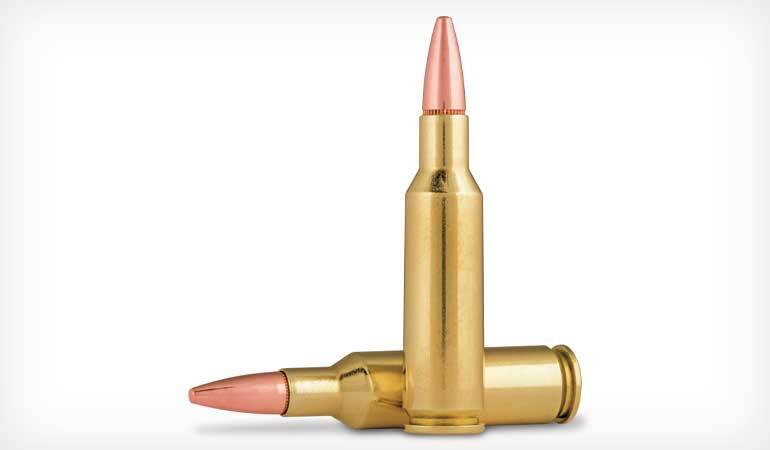 The .22-caliber round pushes the new and ultra-sleek Sierra 90-grain MatchKing bullet at an honest muzzle velocity of 2,700 fps. With a ballistic coefficient of .563, this javelin remains supersonic to over 1,300 yards, with a significant reduction in wind drift and perceived recoil. The .224 Valkyrie case has what Federal calls plenty of “ogive space,” so long, efficient bullets can be loaded to AR magazine length. Federal Premium designed the new .224 Valkyrie to provide optimal ballistics for long-range hunting and shooting. It propels a high-ballistic-coefficient .22-caliber 90-grain bullet at a muzzle velocity of 2,700 fps and a 75-grain bullet at 3,000 fps. Cartridge overall length is 2.260 inches. 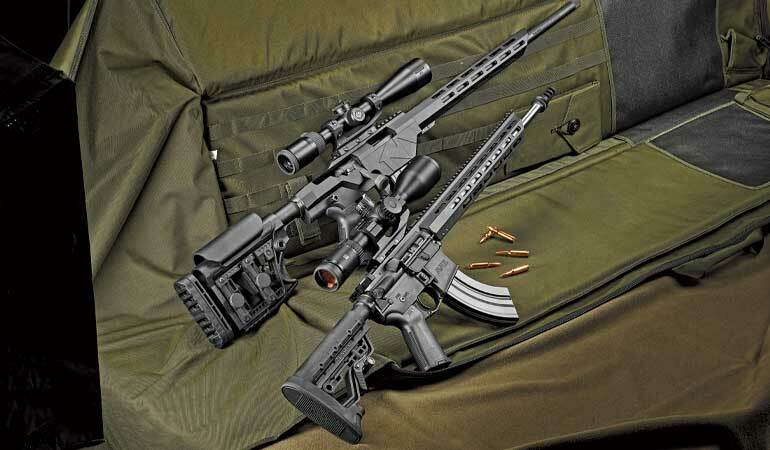 The Valkyrie is designed for optimal long-range target shooting and hunting, so Mossberg decided to cover both bases with two new rifles: the semiautomatic MMR and the chassis-style bolt-action MVP. Both have the most popular features for both types of guns, i.e., flat-top receivers, Picatinny rails, free-floated forearms (with rail slots), adjustable stocks, and threaded muzzles. Shooting Times received samples of both new rifles, but I should note that Mossberg officials stressed that these were preproduction versions of brand-new models and that pending final testing there may be slight tweaks in some features. I gave both rifles a good workout on the range, and I’ll get to the results in a bit, but first, let me tell you about them. The MMR Pro is a typical direct-impingement gas-operated autoloader. Significantly, it has a rifle-length gas system. The MMR Pro has an 18-inch, stainless-steel barrel with a 1:7-inch twist, which is necessary to stabilize long 90-grain bullets. The muzzle has a suppressor-ready ASR mount and comes fitted with a SilencerCo muzzle brake. It also has a Raptor ambidextrous charging handle that is a vast improvement over mil-spec versions. The six-position buttstock has an interchangeable FLEX recoil pad that allows the length of pull to be adjusted from 11 to 14.25 inches. For the winter coyote hunter, the MMR Pro stock has an oversized trigger guard for a gloved trigger finger and a comfortable MOE+ pistol grip. The pistol grip and buttstock are from Magpul. The Mossberg-designed forearm is free-floated around the barrel and has the M-LOK modular system for mounting all manner of accessories, sights, and whatnot. The rifle is lightweight and handy, weighing only 7 pounds, 9 ounces without sights and with an empty magazine. Speaking of magazines, the .224 Valkyrie case is derived from the fat 6.8 Rem. SPC cartridge and so is too large to fit in a 5.56mm magazine, but 6.8 mags work just fine. The MMR Pro comes with one 28-round magazine. Cartridge overall length of the Valkyrie is held to 2.26 inches for compatibility with standard ARs. The MMR Pro has the excellent JM Pro Drop-in adjustable match trigger. This trigger was designed in conjunction with champion shooter Jerry Miculek, and it is adjustable for pull weight from 2 to 6 pounds and for overtravel. The trigger on my test gun broke at a delightful 3 pounds, 4.1 ounces and had almost no backlash. I poked my Hawkeye borescope down the MMR’s barrel, and no tool or reamer marks or any other imperfections were visible. All I saw were beautifully smooth lands and grooves. I am delighted to report that after considerable shooting, the barrels of both rifles picked up very little copper fouling and were super easy to clean. 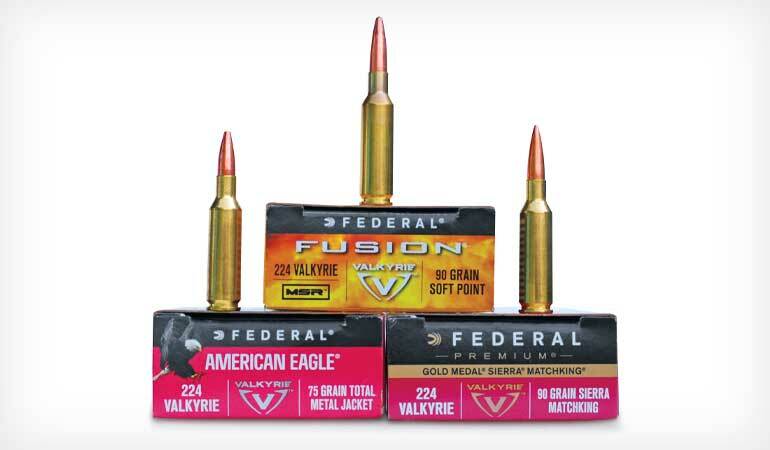 Federal’s initial .224 Valkyrie factory-loaded ammunition offerings include V-Shok 60-grain Ballistic Tip, American Eagle 75-grain TMJ, Fusion 90-grain softpoint, and Gold Medal 90-grain MatchKing loadings. Steve fired both 90-grain loadings and the 75-grain offering for this report and found them to be accurate and fun to shoot. Not all riflemen want a semiautomatic, and for them there is the MVP Precision bolt-action rifle. The MVP Precision shares many of the design features of the MMR Pro, but specially designed for a bolt gun. Metal parts are finished in matte blue, and the synthetic stock comes in any color you want…as long as it’s black. The MVP Pro barrel has the same 1:7-inch twist required for the Valkyrie, but it is 20 inches long. The muzzle is threaded, but unlike the MMR Pro, no brake is installed. Instead, it comes with a thread protector. The barrel free-floats in a slim-profile handguard with the M-LOK slots, and the buttstock is a Luth-AR MBA-3 that is adjustable for length of pull (from 13.12 to 16.5 inches), cast, and comb height. The receiver has an optics-ready Picatinny rail with 20 MOA built in. This allows the shooter to zero for long range without using up all of a scope’s adjustment range. The trigger is the patented LBA that is user adjustable from 3 to 7 pounds. The trigger on my MVP Precision rifle was crisp and broke at 3 pounds, 4.8 ounces. A Magpul MOE+ grip makes for a good handhold, and the bolt’s scalloped, futuristic-looking handle is easy to grasp and use. Here’s a nifty feature of the MVP Precision that caused a little head scratching. Since this was a preproduction sample, no operator’s manual came with it. No problem, I thought. But when I was preparing to clean the rifle before firing, I realized I had no idea of how to remove the bolt. Oh, I found the bolt release, all right; the bolt was just stopped by the stock. After a little searching, I discovered a knob on the buttstock. Loosening it allowed the stock to slip up and off in a jiffy. Then by pressing the little bolt release button on the left side of the receiver, the bolt came out slick as can be. The MVP Precision bore is well-machined and slick, and it didn’t foul up. Another great feature of the MVP Precision is that it also accepts standard 6.8 Rem. SPC AR magazines. The MVP’s bolt has a little plastic flap on its bottom that catches a cartridge rim as the bolt is pushed forward, the round pops up, and into the chamber it goes. I have to admit that at first glance that little flap looked fragile, but it has been used in many rifles for many years and works like a charm. Its design is nothing short of ingenious. The MVP Precision comes with one 10-round Magpul magazine, but just as with the MMR, any AR-type magazine for the 6.8 Rem. SPC will work just fine, including five-round magazines that in some areas may be required for legal hunting. 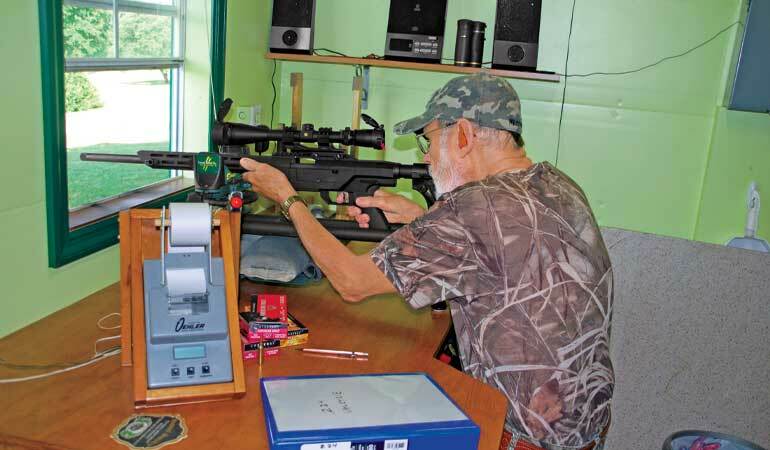 For testing both rifles, I followed my usual protocol of three, five-round groups at 100 yards from my indoor bench-rest. Ambient temperature was in the mid-90s most days when I shot the two rifles, so I cooled the barrels under the air conditioner between groups. I cleaned each rifle after every 15 rounds, and I fired one fouling shot before shooting for groups. Overall, the MMR Pro averaged 0.75 inch for 15 groups. Best performance was, not surprisingly, with the 90-grain MatchKing ammo at 0.52 inch. But at 0.76 inch, the American Eagle 75-grain TMJ was not far behind. The Fusion hunting load was a respectable 0.97 inch. The MVP Precision bolt-action rifle averaged 1.02 inches, but this was only due to the good accuracy of two loads. The MatchKing averaged 0.83 inch, and the American Eagle TMJ averaged 0.84 inch. However, the MVP really didn’t like the Fusion 90-grain hunting ammo, and it averaged 1.40 inches. This is distressing, as the Fusion design is an excellent deer-hunting bullet. The .224 Valkyrie is capable of excellent accuracy. For example, the Mossberg MMR Pro averaged 0.75 inch overall for the three factory loads, and the Mossberg MVP Precision averaged 1.02 inches overall. As expected, there was some reduction in the velocities of these loads in the 18- and 20-inch barrels versus the factory’s minimum-spec and longer test barrels. The two 90-grain loads are listed at 2,700 fps, but in the MVP, the Fusion clocked 2,528 fps and the MatchKing 2,505 fps. The American Eagle 75-grain TMJ is listed at 3,000 fps, and it left the muzzle at 2,851 fps. The results were similar in the MMR semiautomatic gun. The velocities of the three loads were Fusion, 2,485 fps; MatchKing, 2,464 fps; and American Eagle, 2,818 fps. Overall, the two new rifles were unique, well made, and a lot of fun to shoot. Although the variety of available ammo limited testing somewhat, I rate the ergonomics and general handling characteristics of both rifles as excellent, and accuracy was acceptable for the most part. I even got to like the removable buttstock. Mossberg’s great triggers were much better than a lot of triggers on many rifles these days. As we know, all rifles are individuals, so I didn’t let the poor accuracy of one load in one rifle distress me. However, all is not perfect with either rifle in my book. If the MMR was my rifle, the first thing I’d do is unscrew the muzzle brake and throw it as far as I could. Even with earmuffs, the muzzle report was extremely loud. I suggested to Mossberg that it be scrapped or at least include a thread protector as an alternative with this gun. The MVP could use a bit of attention, too. I’d lighten the bolt release spring, as it’s a thumbnail buster for sure. And I must caution shooters to be very careful when cleaning the boltface of the MVP. The sliding-plate extractor is easily pushed out of its mortise, which launches the little silver detent ball and its spring into space. It happened to me, but luckily, I was in my shooting building with a clean tile floor and plenty of light. After much searching, I found both parts, but it was white knuckles for a while. If it had happened outdoors, I would have never found the parts. Replacing the extractor isn’t fun, either. These minor quibbles do not lessen the significance of a storied firm like Mossberg getting in on the .224 Valkyrie ground floor by bringing out these two specialized rifles. I think this new cartridge has tremendous potential.